This yearbook is the fourth in the series with the title Globalistics and Globalization Studies. The subtitle of the present volume is Global History & Big History. The point is that today our global world really demands global knowledge. Thus, there are a few actively developingmultidisciplinary approaches and integral disciplines among which one can name Global Studies,Global History and Big History. They all provide a connection between the past, present, andfuture. Big History with its vast and extremely heterogeneous field of research encompasses allthe forms of existence and all timescales and brings together constantly updated information fromthe scientific disciplines and the humanities. Global History is transnational or world historywhich examines history from a global perspective, making a wide use of comparative history andof the history of multiple cultures and nations. 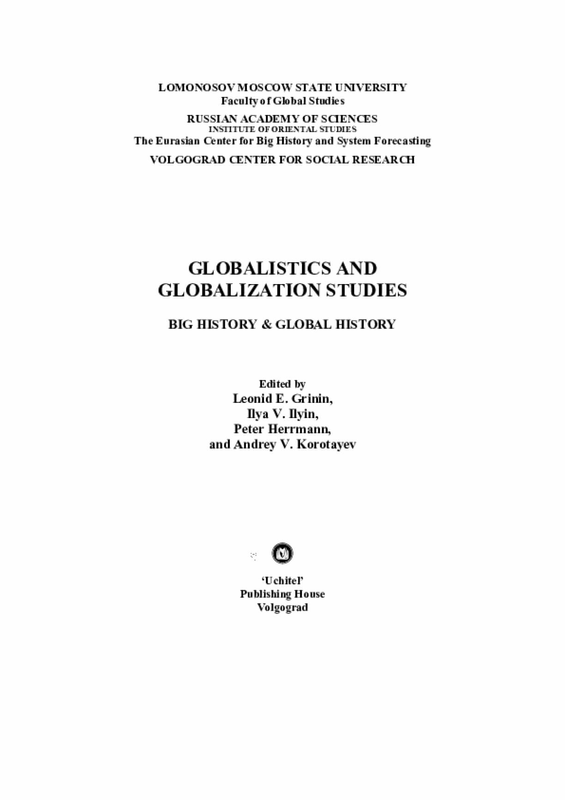 Global Studies express the view of systemicand epistemological unity of global processes. Thus, one may argue that Global Studies and Globalistics can well be combined with Global History and Big History and such a multidisciplinary approach can open wide horizons for the modern university education as it helps to form a global view of various processes. Copyright 2015 by Uchitel Publishing House. All rights reserved.